With cable and satellite companies, we have access to literally hundreds of entertainment channels now. Sometimes that still seems like an insufficient number of choices when you consider the wealth of information and entertainment you can access through the internet. I can watch content on my MacBook Pro, but who wants to watch movies on a 13” screen when I have a 65” LCD TV in my living room? 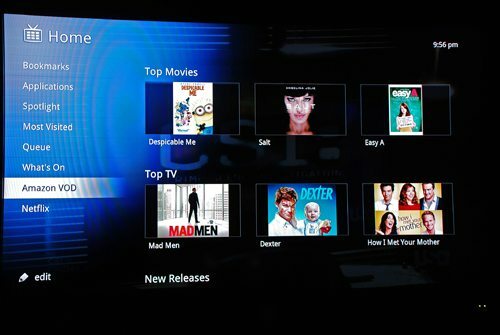 Various media players that connect to your TV and allow you to access Netflix, Hulu, and similar services have been available for a while, but even they have their limitations. 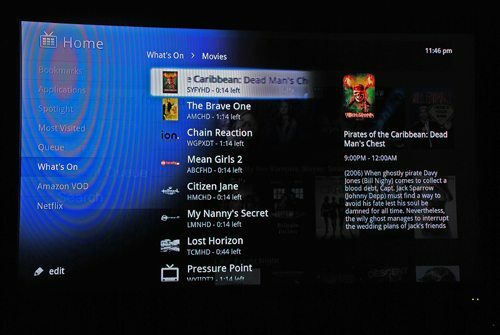 Google developed Google TV to open up the worldwide web to your TV. 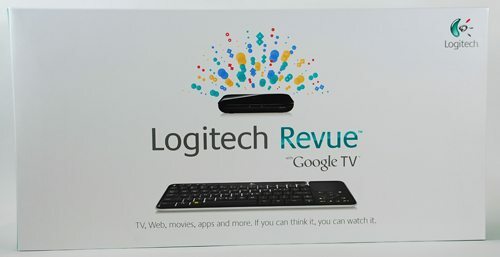 Logitech recently launched the Revue with Google TV, a little black box that brings a world of entertainment to your home HD TV. I was thrilled when Julie sent me the Revue to review, but I was a little apprehensive, too. It seemed something with so many capabilities might be a little difficult to set up or use. Turns out I shouldn’t have worried. The Revue companion box is made of shiny and matte black plastic. It’s about 6.5” X 9.5” X 1.25”. 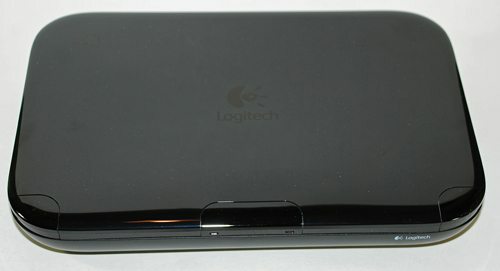 The box is very plain, with only an embossed Logitech logo on the top of the box and a white Logitech name and logo on the front. There are also two green LEDs on the front. Neither LED is labeled, but the left one indicates that power is connected and the unit is in stand-by mode. The other LED blinks while you are entering commands to the unit from the controller. There are IR transmitters at each front corner and one at the center front, but they blend in with the color of the box. The back of the companion box has all the ports and connectors. The leftmost button (identified with the asterisk in the red box) is the “unification” button that allows you to pair optional accessories or reset the unit. 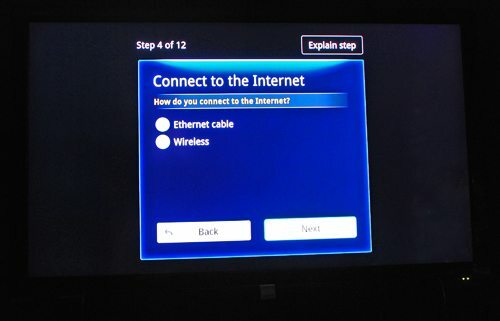 Next is the HDMI-in port; you’ll connect the output from your cable box here. The Revue companion box has a built-in IR blaster to control connected A/V equipment, but the back of the box has two IR blaster connection ports. If you find that some of your equipment doesn’t respond well because of distance or an obstruction between it and the Revue box, you can connect Logitech IR blasters. One is supplied with the Revue, should you need it. Two USB connectors allow you to connect external hard drives, USB flash drives, or the Logitech TV Cam. 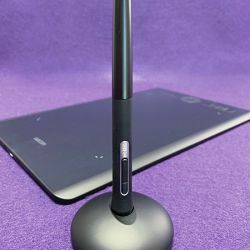 The Revue also has built-in 802.11b/g/n Wi-Fi connectivity, but there is an Ethernet port should you need or prefer to use a wired connection. 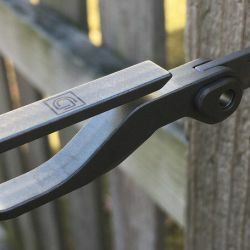 The HDMI-out port will connect (via the included HDMI cable) to your HD TV – and yes, it must be an HD TV or you’re out of luck. There’s an optical audio port to connect an A/V receiver that doesn’t have an HDMI port, if needed. At the far right is the power connector for the included AC power supply. Instead of a traditional remote controller, you receive a wireless keyboard controller. It has a shiny and matte black plastic front and a matte white back. There’s a full QWERTY keyboard, a touchpad, 5-way navigation buttons, and various function keys. The keyboard is about 13” X 4.75”. It is only 0.25” at the front edge (spacebar side) and 0.75” at the back. The back side has the power on/off switch for the keyboard. The back side is also flat, so you can stand the keyboard upright. This keyboard will be used to control the functions of the TV, set-top box, and an A/V receiver, as well as the Revue box itself. Our previous media player didn’t have integral Wi-Fi, so we had a really long Ethernet cable to connect it. The cable wouldn’t fit through the holes we already had to run cables, and we didn’t want to drill more, so we’d just drape the cable across the floor when we wanted to watch streaming Netflix. Since the Revue had Wi-Fi built in, we decided we’d give that a try first. If the wireless connection proved unreliable, we could easily bring out the Ethernet cable again. 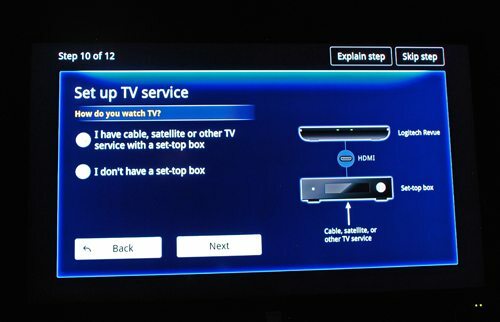 Before you can set up the Revue, you’ll need to know the make and model numbers of your TV, set-top box, and A/V receiver. You start by plugging in the cables. Connect the output from the cable box to the HDMI-in on the Revue. 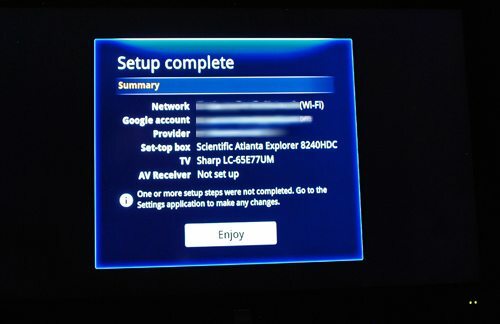 If you have an A/V receiver, connect the HDMI-out to it, or use the optical connector if the A/V receiver doesn’t have an HDMI connector. I don’t have an A/V receiver, just a sound bar. I instead connected the HDMI-out from the Revue to an HDMI-in on my TV. Since I was using Wi-Fi to connect to my home network, all I had left to do was connect the power supply. The Revue box doesn’t have a power switch, so connecting the power put the box into stand-by mode. 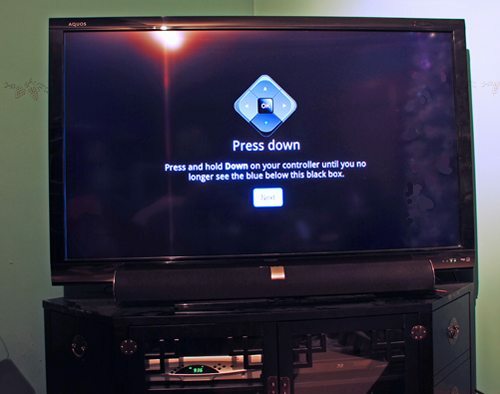 To begin the process of setting up the Revue and keyboard controller and connecting to Google TV, I had to first turn on my TV and cable box using my current remotes and switch on the keyboard controller. 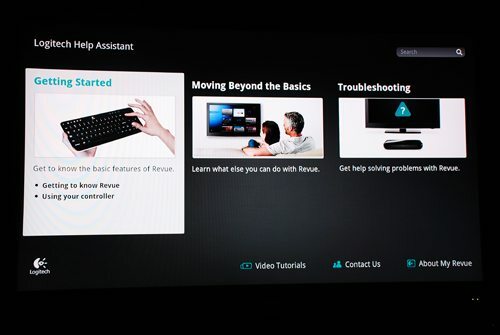 I used the 5-way navigation buttons on the keyboard to expand the Google TV screen to fit the size of my TV screen. 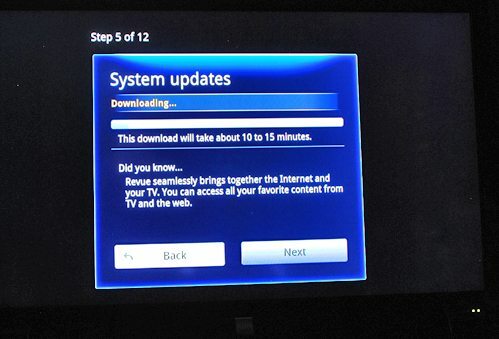 Next, I connected to my network, and the Revue immediately started downloading and installing software updates. The installations completed quickly and without problems. After logging in to my Google account, I had to enter our zip code and choose our cable provider. At this point, I had to identify the equipment that the Revue would be controlling. Our cable box wasn’t one of the pre-defined choices, but it let me enter the make and model number. Since I only have a sound bar, I skipped setting up the A/V receiver at this time. Set up was complete at this point. It only took a few minutes, and everything was easily accomplished. After one more automatic reboot, the controller functions were defined for my TV and cable box. 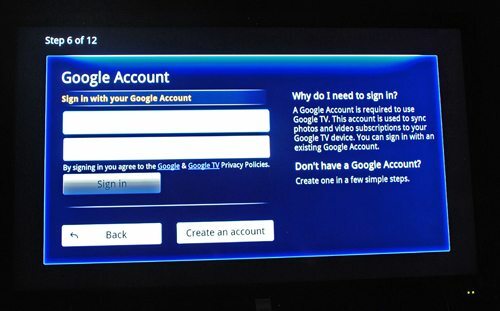 The Revue started playing videos to introduce Google TV and explain how to access all the features and options. I quickly stopped these and started watching a Netflix movie. I’d rather learn by trial and error, and I could always go online or to the Revue’s home page to watch the videos later. If you have questions, you’ll need to refer to these videos. The only manual you get in the box is a setup guide. I couldn’t find a manual online, either. That’s a shame, because I like to have a document to refer to when I have a question. I don’t want to have to watch a series of videos hoping to find the answer I need. There is a series of FAQs type questions and answers you can access from the Google TV home screen, but it’s still not what I’d like for a manual. Before proceeding to the next category, I should mention that I did eventually go into the setup option for the Revue and set up the A/V functions to control my sound bar. Just like with the cable box, my sound bar wasn’t one of the pre-defined A/V receivers, but the Revue was able to look up my sound bar and define a power button and volume adjustment buttons. I can also use the setup option to remove a piece of equipment and define a replacement if I change gear in the future. My biggest problem with watching live TV with the Revue involves the keyboard controller. The IR remote that comes with my cable box has a lot of buttons that are capable of controlling many functions of the TV and cable box. For the TV, I usually only need the power button; the sound is controlled by the sound bar functions. The problem lies with the controls for the cable box. Only a few buttons on the keyboard controller map directly to the functions for the cable box. You can go into the setup option I mentioned before and map Fn+alphanumeric-key combinations to cable box options. I don’t want to have a database to track my remote control functions, so I didn’t bother trying to define every possible control. However, I did define the most important function – the “favorites” selection key so I can quickly flip through my favorite channels so I don’t have to try to memorize a couple hundred channels. I’ll just keep the cable remote close at hand for the few times I need to use one of the more unusual cable box functions. One of the nicest things about the keyboard controller is its size. It is big enough that it’s not going to get lost in the couch cushions. You don’t have to worry about angle when using it, either. Because it sends wireless signals to the Revue, you don’t have to point the remote directly at a tiny IR receiver on the front of the Revue. The IR blaster in the Revue box is strong enough that it perfectly controls all my equipment. Of course, all my equipment is in one cabinet and everything is within inches of each other. However, I do have an external IR blaster should I need it for an additional piece of equipment in the future. When watching cable programming, the Revue is “transparent.” In fact, the Revue simply acts as the remote controls for my TV, set-top box, and sound bar. 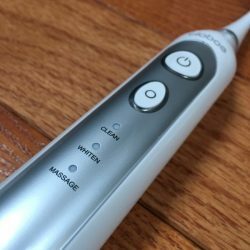 If I wanted, I could use the individual remotes for this equipment, and I do use them when I sometimes need to access a function that I didn’t bother to add to the keyboard controller. There is a button on the keyboard controller that brings up the program guide provided by my cable company. I can use the 5-way controller buttons to navigate through the guide, to change channels, or to set up a recording for my DVR (in the set-top cable box). 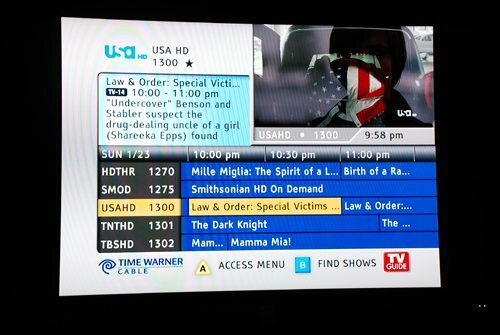 You should note that the Revue itself does not have any DVR functions. 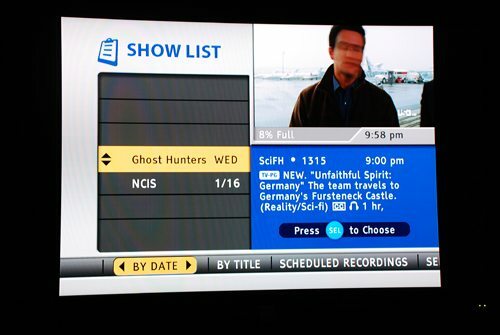 There’s another button that opens the DVR recordings/schedule lists. I use the 5-way controller buttons to navigate the screens and lists, and I can modify scheduled recordings or watch recorded programs. There are play/pause/stop/ff/rev buttons that let me control playback. I can even use the play/pause/etc buttons to control live playback of cable programming, just as I can with the remote that came with the cable box. Controlling playback is a feature offered by my cable company, not the Revue companion box. 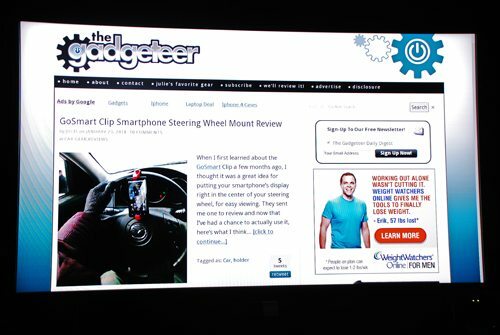 There is a picture-in-picture button that minimizes the live TV picture and opens up the Google TV functions in the large window. 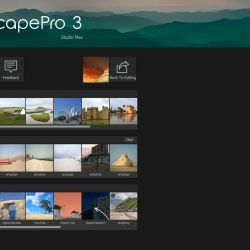 You can surf over to IMDB to look up an actor while watching a movie, check out some pictures on Flickr while you’re waiting for a live weather update, or check a financial report in one of the Google TV applications while you’re watching cartoons. 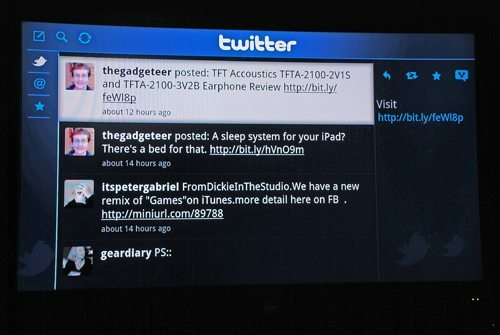 You can be back to full-screen TV at the push of a button. At any time when watching cable programming, I can press the home button on the keyboard controller to switch to the Google TV functions. There are dozens of functions and services offered by Google TV. 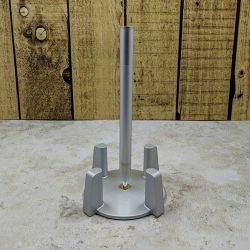 I sometimes have trouble remembering that I am writing a review instead of a user’s manual, so I’ll try to hit the high points without getting too pedantic. When I was reading about the Revue, I saw people mentioning that the buttons controlling the Google TV functions should be familiar to Android users. I haven’t used Android, but I don’t think a home button or a back button is exclusive to that system. I remember those functions and buttons in my old Palm devices. Anyway, once you’ve selected the Google TV function, you navigate the screens using the touchpad (it has the separate button bar like my old Dell computer) and the 5-way navigation buttons. 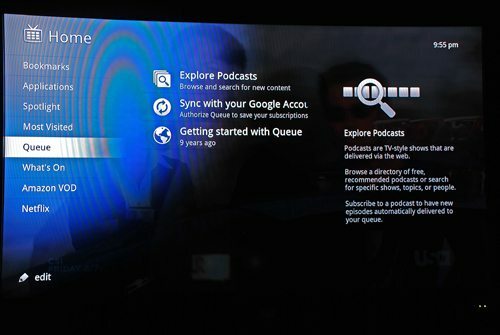 Pressing the home button overlays the Google TV home menu on the TV show that’s playing. You can still hear what’s going on in the live show, but you can’t really see what’s happening through the slightly translucent home menu. You can return to live TV at any moment by pressing the TV button or the back button. The Google TV home menu has a variety of options that can be edited to add or delete options, as you desire. I found the menu and the sub-menus to be a bit repetitious. 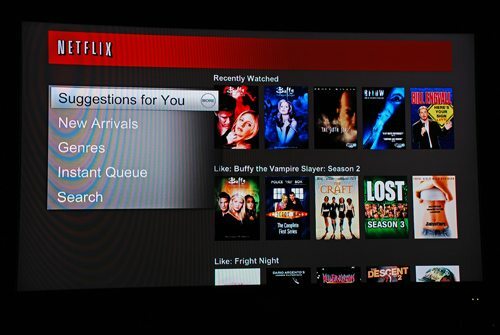 For example, Netflix is repeated in several menus, and its function seems to vary a bit depending on the previous menu. I don’t like the repetition, and I need to spend some time seeing how to best simplify the menus and remove the duplication. There’s a Google Chrome app for surfing the internet. Surfing isn’t super fast, but it is usable. The pages are displayed normally, and multimedia content is accessible – even Flash video will play. Screen resolution was sharp and clear on my 65” screen. You can save bookmarks to your favorite websites or you can add them to your Queue to find the webpage of interest quickly later. 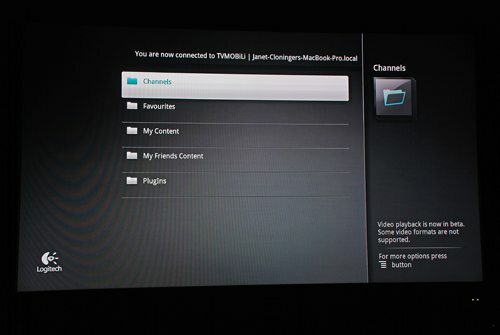 Some of the applications require you to subscribe to their service before you can access it from Google TV. For example, Pandora, Napster, Picasa, and Netflix require accounts or subscriptions. I already have a subscription for Netflix, and it is very important to my family that Netflix works well. Watching a streaming movie from Netflix was one of the first things we tried. Netflix worked well with the media player box we had before, but that one had a wired connection to our router. We were a bit concerned that the Wi-Fi connection wouldn’t work as well. We do have a lot of speed and a lot of bandwidth with our internet service, and we’ve got a high-performance router. I was very happy to see that our Netflix streaming downloads worked flawlessly. We’ve watched high-def programming and standard-def programming, and we’ve never experienced a single glitch. It’s wonderful to not have to drag out the Ethernet cable when we want to watch a movie. The Netflix app has much more functionality in Google TV than it had with our previous media player. With our old device, we could only see things already in our Instant Watch queue. We couldn’t search in Netflix or add things to the queue from the old player. With the Revue, we can access or add to our queue. We can search for content and start it playing immediately. There’s even an application that will show you new content and let you start playing a movie immediately. There are no apps that connect you directly with peer-to-peer sharing services for content. 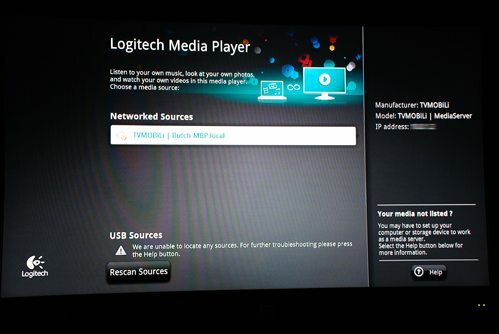 However, you can access anything you’ve downloaded to your computer with the Logitech Media Player app if you have a DLNA (Digital Living Network Alliance) server on your computer. Logitech help can recommend some compatible DLNA servers, but I Googled and found the one I used. I loaded up TVMOBiLi on my MacBook Pro and was able to access video, picture, and music files from my computer’s disk. TVMOBiLi supports iTunes formats, and I could play many of the files – music and video – stored in my iTunes directories but not all. I had no problem accessing the files that I had ripped from my CDs, but I couldn’t play many of the files I bought through iTunes. I assume the files I couldn’t play were protected by DRM. Also, you can access any files on a disk or flash drive connected to one of the USB ports on the back of the Revue companion box. Other applications let you access Logitech Revue help services. You can access your Twitter page, and you can even do automatic Tweets from some of the options. You can see and access your bookmarks from the Google home menu. The Queue option will collect your RSS feeds, Google subscriptions, and saved links to webpages in one place for easy viewing. The Spotlight application gathers links to various video services in one location so you can watch YouTube videos, Vimeo, HBO Go, PBS Kids, Flixster, and others. Again, some of these require a subscription to access content, like HBO GO. 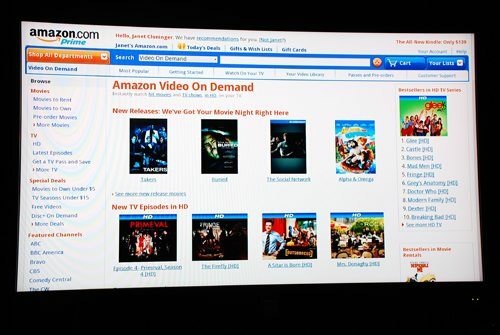 You can search for, select, and watch Amazon Video On Demand. I’ve tried a couple of downloads from Amazon VOD, and they played as flawlessly as Netflix. Obviously missing from the list is Hulu, Hulu Plus, and ABC and CBS video services. Since there was no Hulu option in the Spotlight application, I had the bright idea to surf to Hulu.com using Chrome and try watching something from the website. When I navigated to Hulu, I was informed they were not allowing Google TV users to access their services. They said they planned to eventually offer a Hulu Plus app to Google TV. Until then, there will be no Hulu joy. ABC and CBS also blocked me from watching videos from their website. It’s not available yet, but Google has announced that Google TV will be able to access the Android Marketplace to purchase apps. That’s supposed to happen later this year. 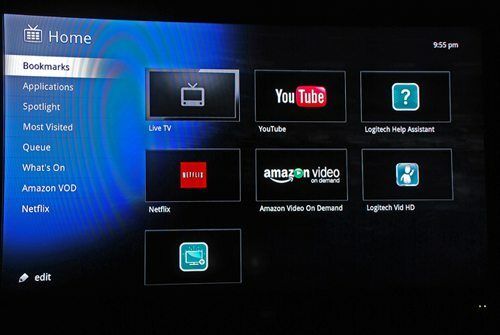 They are also promising to expand the capabilities of Google TV. There are other functions of Google TV, some of which I’m sure I’m not yet aware. However, I did promise that I wouldn’t write a manual, and I’m trying to not list every single app or video service. 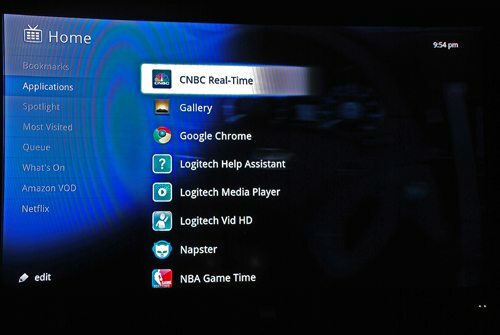 Suffice it to say that I am enjoying using the Logitech Revue Google TV. I like using the keyboard controller as my universal remote, at least for my most common functions. I love how well the wireless connectivity works for streaming video. I’m interested to see what other functions will be added in the future, and I’m interested in learning what I don’t know that I don’t know yet. 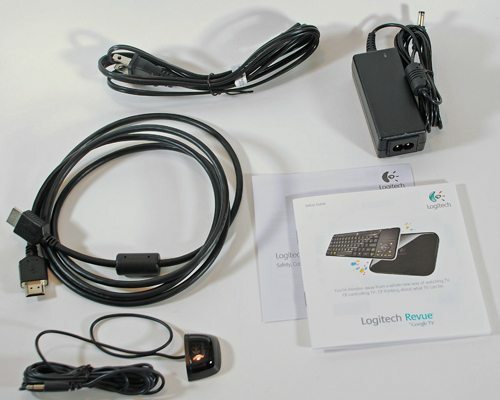 I will be doing a couple more reviews related to the Logitech Revue. Logitech also sent along a Google TV Cam that will let you do video calls that I’ll be trying out. I’ll also be reviewing the Harmony remote app for the Revue. Look for them in the future. 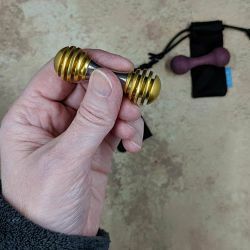 I will be looking for how this integrates with a recorder, wanted to see more of that in the review above. Does it search my recorded programs? Does it search on refined criteria the program schedule. The Hulu Plus app is going to be critical and we need net neutrality to sustain what Google is doing. I’ll look at the Dish integration, but why do they get a surcharge? Do they provide some tech support? I love the concept here, hope they make it! I am so glad that I was given a Logitech Revue from my job at DISH Network. I especially like the integration feature with my DISH equipment, I can search my guide, DVR and the internet with a single search. Plus with the preloaded Netflix app you can stream your favorite movies from your couch! Listen,i bought the Logitech Revue with high hopes, there is nothing on this thing that isn’t on your computer,save your money,buy a cable to go from your computer to your tv.In the last few months they have only added 2 new channels,one is a game to play using your phone,its called WE DRAW,its stupid,the other one is to browse real estate in your area, are you kidding me,that is the best they can come up with.If you are gonna buy something for TV entertainment,buy the Roku,it has soo much more to offer………. That seems like a pretty high price to pay for not much more content than Netflix. I’ll stick with my Roku for now. 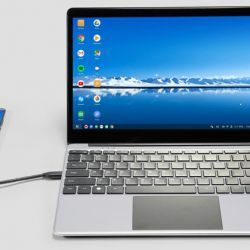 @Ralph, I had heard that Logitech had reduced the price of the Revue. 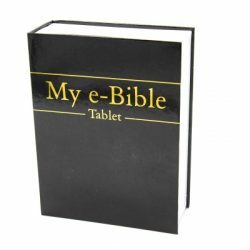 I checked today and found they are selling it for $99.99. So, the Revue does DLNA, Netflix, HBO GO, Amazon VOD but no Hulu Plus and nany providers block it. 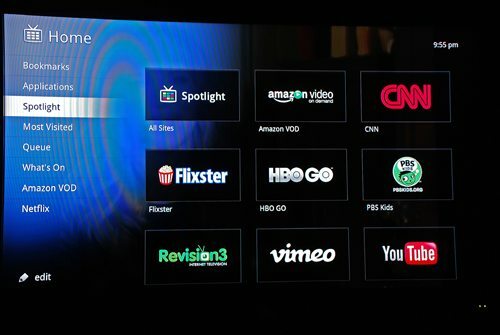 The Roku does Netflix, Hulu, Amazon VOD but no DLNA – no mention of HBO GO, so probably not. Does any set-top box do (by order of importance) DLNA, Hulu Plus, HBO GO, Pandora and possibly some other streaming content? Closest to this is my PS3, but I have to do Pandora via the web browser as Sony wants to sell me their pay music streaming, no news about HBO GO or Amazon VOD. As a long-time Netflix DVD renter, and after comparing what is available between their (used to be a $2 add-on) video streaming and other providers (Hulu – more content, Vudu – not ancient) I fail to see why Netflix streaming is the one service everything provides. You said you had a soundbar so you skipped the A/V setup screen. How did you go about programming the keyboard to control the volume on your soundbar? I have only been able to get it to control the volume from my TV (which is set to zero since I only use the soundbar)? @Carlos I added the soundbar as a device by going into the Settings application in the Revue. My soundbar wasn’t one of the suggested devices in the receiver category, but it let me enter information about my soundbar make/model and it found the information it needed for my bar. One of the setup questions was whether I wanted the volume buttons on the keyboard remote to control sound from the TV or the soundbar. I chose the soundbar. I used my TV remote to turn its volume all the way down; I could have muted it, but a little icon stays on the screen while the TV is muted. It works like a charm for controlling the volume, and the “AVR” power buttons works to turn it on and off. @Carlos I’m glad you got it set up! You’re welcome! 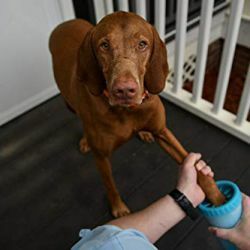 Thank you for the review i have been trying to figure out a easy to get rid of the cable bill with this can go to basic. I’m trying to start a video buffering on one tab of the Chrome while watching on another tab, but the first tab keeps disappearing. Am I doing something wrong? Just found that I can use the free Android app, “WIFI Keyboard” to connect the Revue keyboard to my HTC EVO & Hero phones. I can then switch the input back to TV, and watch TV while I continue to type on my phone. The Revue is a nice travel unit. It would be nice to see a follow-up to this excellent review. Also, would it be possible to tell me: Would the Sony blu ray google controller be usable with the Revue. 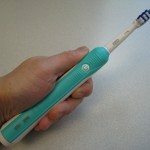 I have one, and like it’s size and simplicity, plus i wouldn’t have to buy one! My Dish Box signal goes to my second tv wirelessly. 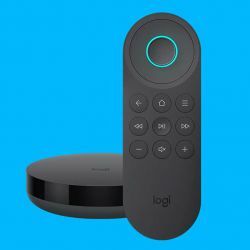 Is there a way to connect to Logitech revue so that it is available to either tv 1 or 2? 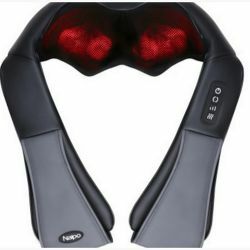 Would that create any issues with keyboard controller setup? @Cmoore You’ll maybe have better luck asking that question at Logitech’s support page.